Coming from a Microsoft XNA background (where everything is wrapped nicely) I found some difficulties learning OpenGL ES 2.0, the things I missed the most were classes like VertexPositionNormal, GraphicsDevice. Java doesn’t support unsigned primitives, so if you’re using short for the index buffer creation (is there another option?) you’ll be limited to 32,767 different vertices per draw call, in other words you can only have 2^15 -1 different vertices indexed in your index buffer, that might seem like enough vertices for a single draw call, I just hate to not be able to use half of the range of the type short. Update 30\10\2012 : please check this comment for a really easy solution to this issue. I tried to wrap OpenGL ES 2.0 a little, you can find the classes in the package com.fuchsgl.framework. And here’s the source code (eclipse project) : FuchsGL Source.zip (621 KB). All you need is to open the HTML page in a browser that supports WebGL like Firefox or Chrome (not IE ;)). Here’s the source code for the web version of the terrain : WebGlLab.zip (530 KB), the code here is organized in folders similar to the Android version. if it’s not working on your browser then maybe WebGL is disabled, you can enable it by following the steps here. Terrain texture and height map generated using L3DT Standard, amazing tool for terrain generation with lots of options even for the free standard edition!. Android screen recording done using Screencast Video Recorder, the demo version allows you to record 20 seconds max. 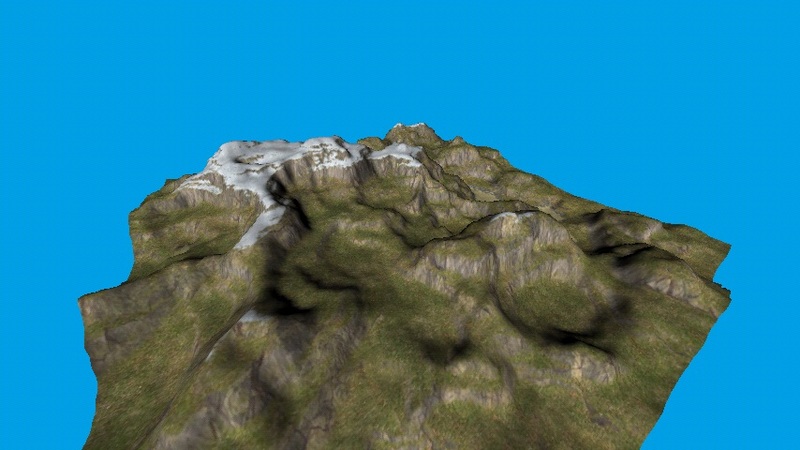 I hope you like my terrain :D.
“Java doesn’t support unsigned primitives” I wonder if it works if you use unsigned math. You could always use char, which basically is an unsigned short. Otherwise I also think you can do something like this: putShort((short) (index)); where index is an int that ranges from 0 to 65535. This works because the narrowing conversion just discards the extra bits. this way less changes were made to the code! Thanks for your help :), it’s really appreciated :). BTW: great job you’re doing in your website! The apk file doesn’t seem to work on my galaxy Nexus – it shows the splash screen and then the screen just goes blue. Any idea what’s up? Strange! anyway I’m trying to figure this out on a friend’s phone which is having the same problem. I checked the parameters and all of them were correct! Debugging is hard since my friend lives far away and I’m sending him the apks to try them on his phone. Let me know if anything comes up! Cool. I could test, send you logcat etc. as well if you like? After more testing it appears that the problem is when calling Effect.glSetUniformMatrix4fv on the World matrix, I tried re-ordering the lines of code to update the View matrix first and no problem was caused until the code tied to update the World matrix! for some reason only the World matrix is causing problems when updating it in the shader! If you debug the previous code only the errWorld should have a non-zero value, probably 1282, if not then there’s another problem! I’ve seen other OpenGL Es apps defining one matrix in the shader called modelViewProjection, I defined this matrix as three independent matrices, I’ll try to modify the app to make it one matrix and see if it works. Still not working on my friend’s device! this is driving me crazy! One strange thing is that the WebGL version worked on the device! the WebGL version is just a port of the same code to WebGL! can you please try the WebGL version on your phone? Actually it does help a bit, this means that an error is happening before & after modifying the world matrix in the shader, but I really have no idea what to do from here! Thankyou very much for this tutorial, it has been very usefull. Without this fix, the textures appeared as plain black. Hi, thanks for the tip, the two lines you provided are added in the newer terrain demo (Android Terrain Test 2 : Clouds) which contains other fixes and improvments 🙂 . …BTW, can you tell me which modifications are needed to handle bigger heightmaps (like 1000px X 1000px) ? The limit comes from the limited range of the type short used in indexing vertices. Even if this limit didn’t exist it’s not practical to draw the whole terrain. You can find lot’s of papers and tutorials on those two techniques.